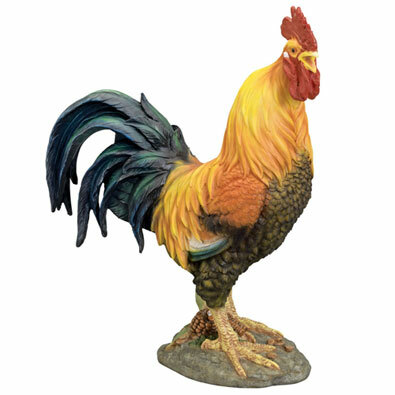 Our Life Sized Rooster statue is a polyresin sculpture of a realistic looking rooster crowing at the day. A fun lawn ornament to surprise visitors with or to add a touch of farm life to your yard, patio, or garden. • Life Sized Rooster Statue stands 18" tall. *Sorry, gift wrapping is not available for Life Sized Rooster. Our Life Sized Chicken statue is a polyresin sculpture of a realistic looking chicken pecking at the ground. A fun lawn ornament to surprise visitors with or to add a touch of farm life to your yard, patio, or garden. • Life Sized Chicken Statue is 17" long. *Sorry, gift wrapping is not available for Life-Sized Chicken.